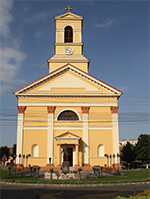 Sânnicolau-Mare (German: Großsanktnikolauß, Hungarian: Nagyszentmiklós, Serbian: Weliki Semiklus) has approximately 12.000 inhabitants and turned into a strong economic centre of western Romania after 1989. In the middle ages, Benedictine monks settled in the Mureș valley. Close to Sânnicolau-Mare, the large Benedictine monastery Igris and the bishop’s seat of Morisena could be found. The latter was financed by Gerhard, a monk and martyr who was later sainted and who educated Stephan I, founder of Hungary. Until the 18th century, the population of Sânnicolau-Mare mainly consisted of Romanians and Serbs who were breeding cattle. Until 1756, the settlement of the “German village” of Sânnicolau-Mare (which was called German Saint Nicolas) is registered in official documents. Most of the German settlers were farmers or craftsmen. The majority of inhabitants were Romanians who had been settled in Sânnicolau-Mare in the mid-18th century by the Greek brothers Christoph and Cyrill Nako. The Nako-brothers, who came from Greek Macedonia, had acquired wealth as suppliers for the Ottoman troops. From 1718 onwards, they supplied the Habsburg troops and the court in Vienna. 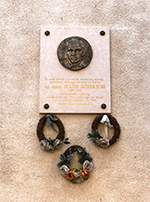 Béla Bartók (1881-1945), composer and pianist, was born in Sânnicolau-Mare. His father was a teacher at the local agricultural school. Bartók repeatedly returned to his hometown in order to get inspiration for his compositions. Nakó Castle is the city’s landmark. It was built in 1864 and used to have a dendrologic park. Today, only two old Gingko Bilboa trees remain in the octagonal tower room of the castle. 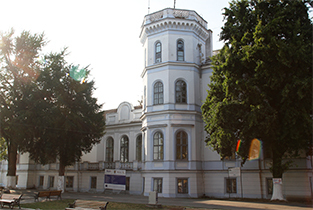 The castle today holds the Béla Bartók Museum and the culture house. In the castle’s foyer oil paintings by Franz Ferch, a German artist from Banat, are on display. In 1965, a German high school was founded in Sânnicolau-Mare. Many children from surrounding Swabian villages went to the school. Under the supervision of the German teacher Dorothea Götz, a circle of young litterateurs developed in the 1960s who called themselves “Banat Action Group”. Nobel prize winner Herta Müller refers to them and although the group only existed for a short period of time, they are considered the most influential literary movement of Romania. 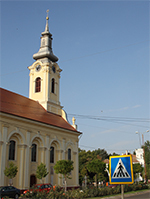 LEFT: The impressive Roman-Catholic church of Sânnicolau-Mare was donated by Count Alexander I Nakó and was built between 1814 and 1824. RIGHT: Serbian-Orthodox church in Viennese baroque style with interior decorations by Ioan Zaicu. 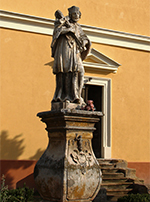 LEFT: The church’s courtyard olds one of Banat’s oldest statues of Saint John of Nepomuk, who is Banat’s patron saint since 1716. Nakó Castle, the city’s landmark, was built in 1864.